10″ x 14″ x 0.75″, oil on canvas, ready to hang. Have you been on the road to the sea? Turn off from the main road onto a narrow lane where the grass grows in the middle. As you head down the road through the rain clouds, what strikes you is the light on the horizon pulling you, magnet-like, ever onward to the coast. It has a lustrous silver quality. In this painting, it was one of those days when the rain came and stayed. The clouds were so low it felt like I might touch them but towards the end of the day a chink of blue and silver light appeared on the horizon. Gradually, it spread across the sky filling the clouds with a luminous light. The wooden electricity poles stood tall and thin, black and gaunt against the silver grey sky. Their solidity and stillness shifted the perspective in someway and heightened the clouds’ movement against the dark cables threading their way across the landscape. The painting tries to capture that fleeting moment when dark moved into light and then back again in all its fugitive qualities. But it’s also about the built expectation the light at the end of the road conjures up. What you think of my painting? And, have you experience such a moment? All the signs of civilization are dark and static against that brooding, shifting, sky and its “fugitive” light. (Great word.) 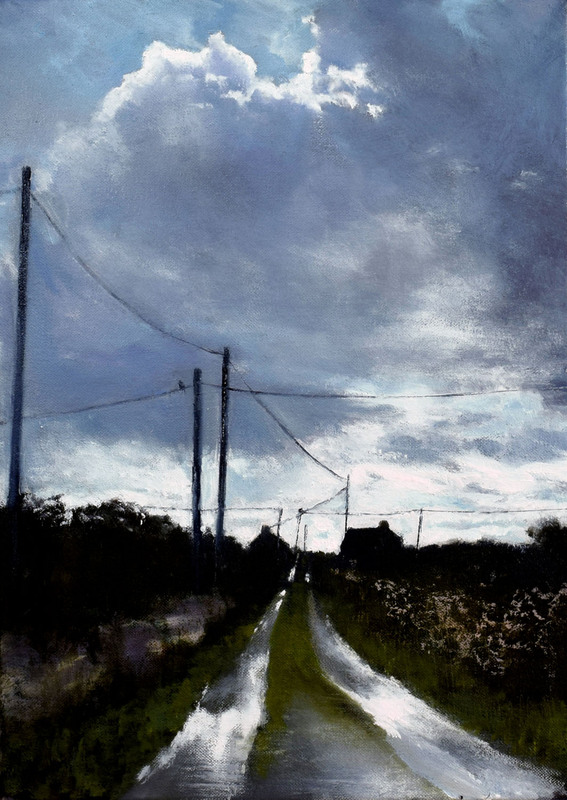 The evidence of human hands is somewhat rare in your work, John, and here the featureless houses and angular poles and wires stand in sharp contrast to roiling nature, whose forms are alive and moving. I have been on roads like this, where the distant light beckons and the silver reflections below lead me on. The emotional pull of the path leading off to a far horizon is irresistible and almost hypnotic. That this road leads to the sea makes the pull even stronger. I want to see what is beyond the next rise in the road, but the road itself is so mesmerizing that I long to capture the ongoing magic of each moment as it passes and almost don’t care whether I ever get there. Yes it’s true about the sign of human hands in the paintings, it certainly is rare Jo. I was interested in your comment ‘the dark and static’ signs of civilisation, which I hadn’t thought of till you mentioned it. It acts as an interesting counterpoint I think. The dark and the light. I know how fond you are of a path and the not knowing what lies around the bend or over the brow of the hill. It’s great to hear that this road you also found ‘mesmerising’ Thank you very much for your comment. Every cloud has a silver lining! I like the combination of hard and soft edges of the clouds – really creates a sense of dynamism. Hello John, this is a moody, atmospheric painting and it brought to mind one of those rainy days which, just as you have described, reveals a special light as the clouds lift from the horizon. There is a sense of anticipation at the prospect of the sea view over the brow of the hill and the possibility of sunshine ahead. How marvellous it is that you have captured all this with the artists skill of colour, light, shade and perspective! I love the feeling of being in the lane, protected by hedges and stone walls and the architectural structure or arbour of lines above. A lovely painting. Thank you for your thoughts on the painting which very much aligns with my own. A moody painting of that ‘special light’ you mention. I too felt the same way about the lane or ‘boreen’ protecting us on either side.